You do not have to look very far to see a spider’s web. In the corner of the window, on a fence, or in a bush, spiders make their homes everywhere. And there are so many kinds of spiders! Some are red while others are yellow, but not all sights are fascinating. Much like a recent video that is sending shivers down the spines. 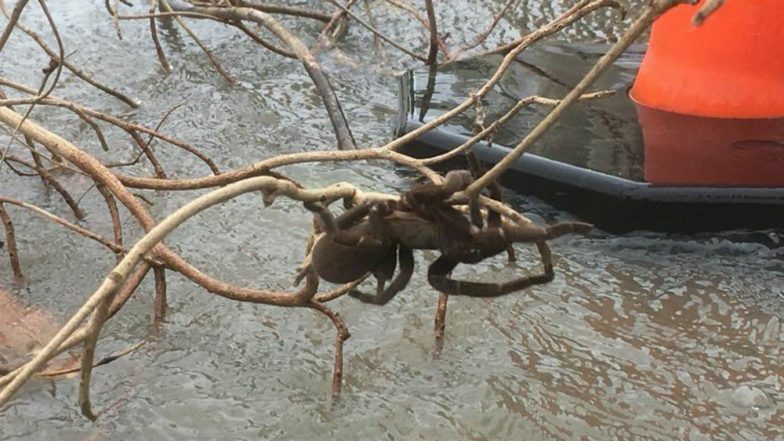 A footage of a huge spider hugging a branch above the flooded Herbert River through North Queensland in Australia has been posted on Facebook and has in no time went viral. A few seconds video has become more like a horror film to the netizens. Andrew Gilberto uploaded the original video of the giant spider that was spotted very close to Halifax’s Spar supermarket. While many people would run to the opposite when face-to-face with such an enormous creature, what the localists did would surprise you. Channel 9 reported that the nearby residents plucked the branch from above the river and placed it on an avocado tree near a pharmacy in the town centre. Far away from the flooded water, but significantly close to humans! According to media reports, it is believed to be known as a Whistling Spider, so named for the hissing sound it makes. Here is the video of the giant spider rescued from Herbert River, North Queensland. The horrific sight has made rounds on the internet and here is what Twitterati has to say. Well I won't be visiting North Queensland for a while...or ever. Does it comes to your mind too? I have no words! Fear, anxiety, leaving the country comes to mind!! It was just a tea towel! Torrential rain for much of the last week has caused flooding across the region with the area between Townsville city causing disastrous effect as declared by the State Government. And the photos and video posts from the people have been gaining huge followings online. But this giant spider is terrifying and the bold move of the locals is quite appreciated.